One of my *favorite* parts about blogging is all of the amazing creativity out there! I’m so excited to see what everyone shares! Plus, since we’re co-hosting this link party, everything you share here will also be shared over at The Thriftiness Miss. 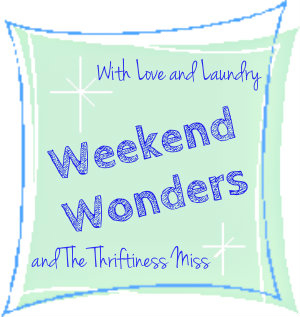 Follow your hosts, Love and Laundry and The Thriftiness Miss via GFC, bloglovin, or Linky Followers. If you are a new follower, leave a comment and let us know how you follow and we will return the favor. Oh yay!!! I’m so excited to be linking up to your party. I’ll be sure to add it to my party page! Have a great weekend! I’m new follower & linker! Thanks for hosting! I’m not linking up this week, but I love seeing all the posts :) Thanks for hosting, I hope to join in sometime soon! Hi Shatzi! Following you from the Naptime Review. Loving your pretty blog! Can’t wait to go enter that Shabby Apple giveaway!